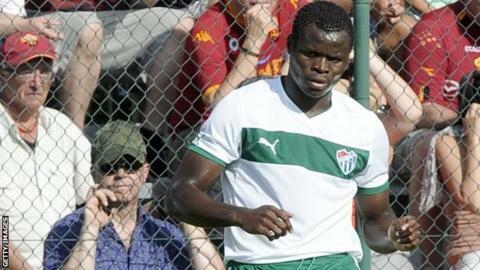 Nigeria's Taye Taiwo, who has moved back to Finland, has played in six European leagues in five years. Former Nigeria international defender, Taye Taiwo, says he is delighted with a return to Finland following his move to top side RoPS. The much-travelled Taiwo moved to the Rovaniemi outfit this week until the end of the season. He returns to Finland 18 months after he left Finnish giants HJK Helsinki, for whom he scored nine goals in 45 matches. The 32-year-old has 59 caps for Nigeria. "It's exciting to return to a familiar league and nice to reunite with the RoPS coach Toni Koskela," Taiwo, who has played in six European leagues in five years, told BBC Sport. "We know each other from our time at HJK when he worked there, so it was not a difficult decision to come here. "Since I left Finland, I've played in Switzerland and Sweden, but I feel good about this next step." Taiwo's biggest success came during a six-year stint with French side Marseille, his first European club which he joined in March 2005. He won the French Ligue 1 title with Marseille in 2010, as well as back-to-back French League Cups in 2010 and 2011. He also won the 2010 French Super Cup. The left-back made over 200 appearances for the club, scoring 21 goals before joining Italian giants AC Milan in 2011. He struggled to establish himself in Italy and then spent six months on loan at English club QPR in 2012, before another loan at Ukrainian side Dynamo Kiev. He then joined Turkish club Buraspor on a permanent deal in July 2013, leading to further stints at Finnish side HJK Helsinki, Switzerland's Lausanne-Sport and Swedish club AFC Eskilstuna. Taiwo featured in the 2005 Fifa World Youth Championship where he was voted the third-best player of the tournament in the Netherlands, behind Lionel Messi and compatriot John Mikel Obi. He also played for the Super Eagles at the 2006, 2008 and 2010 Africa Cup of Nations tournaments. His last appearance for Nigeria at a major tournament was at the 2010 Fifa World Cup in South Africa.